Inspector, Lower Division Assistant and other posts through online or offline. 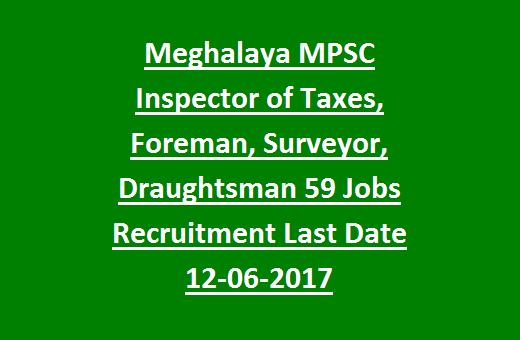 There are total 59 vacancies available Meghalaya PSC Recruitment 2017. Last date for submission of application forms either offline or online is 12th June 2017 up to 05:00 PM. Candidates can who are willing to apply online for this MPSC Jobs of Inspector of Taxes, Surveyor, Draughtsman and other posts the can submit application through www.mpsc.nic.in. For offline download the application from the same MPSC website. Selection will be based on screening test, main examination and personal interview. 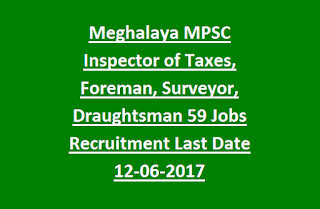 For more details of Meghalaya MPSC Recruitment of Inspector of Taxes, Suryeyor, Foreman and other posts qualifications, age limits, salary, selection procedure and more is given below. There are total 59 vacancies available in current recruitment of MPSC. For all the posts age limits are 18-27 years. and for SC/ST candidates upper age limit is 32 years. For post wise vacancies refer official notification. For Inspector of Legal Metrology, Foreman, JE, Inspector Of Taxes and Cold chain Officer application fee is Rs.350/- and for all other posts Rs.320/-. For SC/ST candidates half fee will be charged under application fee. Selection for this MPSC Recruitment will be based on Screening Test Without Syllabus, Mains Examination and Personal Interview. For offline candidate can get the chalan form and application form in MPSC offices or download from the MPSC official website @ www.mpsc.nic.in. For applying online submit application through MPSC official website of www.mpsc.nic.in.